One of the most important things committee members can do to ensure a successful reunion is to involve the classmates in the decision-making process. However, there is a fine line between asking for specific input or simply "asking for ideas". Asking specific questions that help guide the committee members to find the right venue, at the right price, at the right time of year is very important. 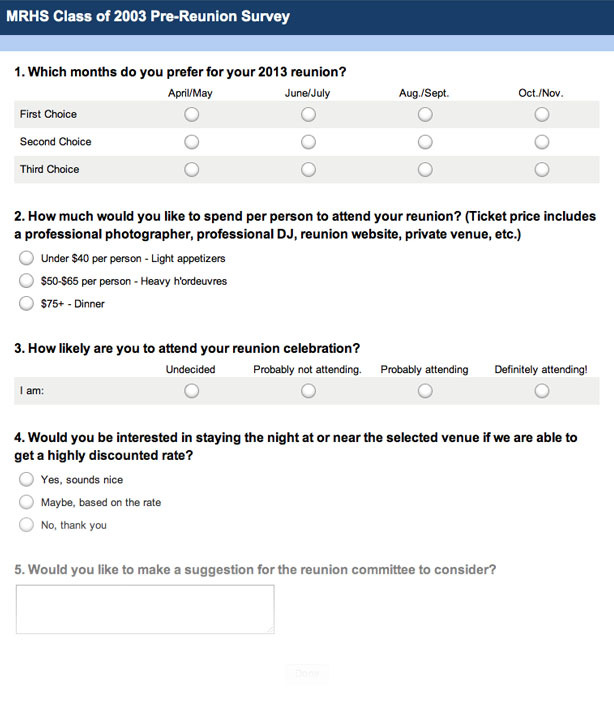 Having a free-for-all with everyone suggesting venues and specific dates is completely unmanageable and time-consuming. Reunion Coordinator has the experience to give the Alumni a feeling of involvement without opening up a can of worms that leads to committee members trying to decide between multiple venues and various dates without hurting their classmate's feelings.